Seth Godin Recently Launched a SkillShare Course on Modern Marketing. Revolutionary. Innovative. Modern. These are words that come to mind. Godin describes the evolution of marketing over the last 50 years. After dissecting the out-of-date model, he brings out the big guns. The Action Theory of [Modern] Marketing: the improved marketing for a digital era. Well, we took some notes. Godin expresses that every marketer, business and product must address 4 key elements in the modern marketing model. Let’s explore the action theory. When you make a product or service, you are appealing to the emotional needs of your customers. A business connects to the buyers through two key emotions: delight, and fear. Choose what emotion you want to invoke, and in who. Delight- How can you best exceed the expectations of your customers and create a product that delights them? Fear- ie. If you don’t buy this, you will regret missing this opportunity. Great companies cause their customers to change. The experience of using their product changes the way they perceive other products. This change moves your brand and your customers forward. For example, Charity Water has changed the way we view non-profits by showing exactly where the funding goes. They geo-locate and photograph the people that the customer is helping directly. What ideas will your product leave with your customers to give them new thoughts or perceptions? Deliver anticipated personal and relevant messages to the people who want to receive them. Brands gain this privilege through permission marketing. This gives brands the opportunity to alert their followers when new and exciting things arise. 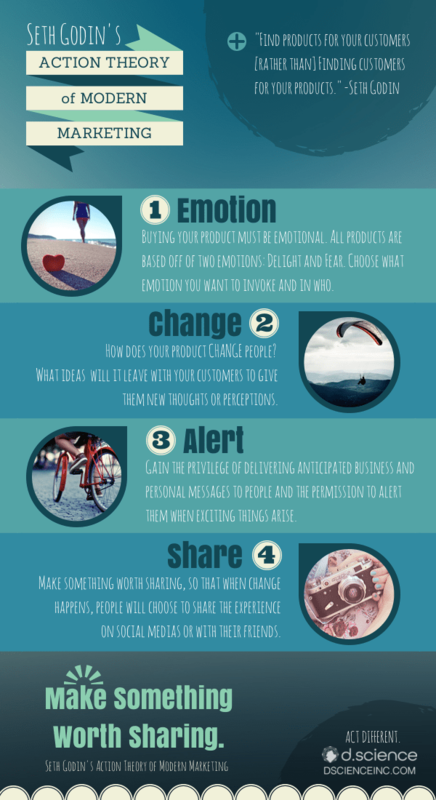 Make a product that people choose to share when they experience change. We experienced a change in our understanding of marketing from Seth Godin and chose to share it with our readers! Check out Seth Godin’s blog and sign up for his modern marketing course on Skillshare.